Forty thousand-some-odd years ago, a brave Neanderthal mixed dirt, plants and animal blood together and drew something on a rock. With this, outdoor graphic communications was born and the world was forever changed. Ever since then people have made their mark, shared ideas, and influenced the masses. With it each generation has advanced these communications up to today’s cutting edge digital imaging technology. Defined as an out door graphic/message designed to encompass a build or structure. 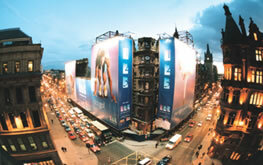 Building wraps are a ultra mammoth outdoor advertising medium that can create a positive and groundbreaking impact. They are a highly versatile medium which can easily capture the attention of all in sight. Call them building wraps, building graphics, or giant wraps, these vinyl/mesh pictures, hung together on a building, have created a new marketing option. How bigger can you go than advertising on city centre buildings? Wrap it and they will see it. It cannot be ignored!. The sheer impact a building wrap makes alone is extraordinary. 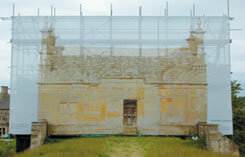 Wraps do not need to cover the whole building, but many you will see cover a large part. These graphics, depending on the size and location may be seen for great distances. People may think that a building wrap will look out of place, graphics rather than bricks, but artistically wrapped the results are amazing. Simple graphics also work in a less is more avenue of advertising. Striking letters and simplicity means that the viewer can glance at the image and know instantly what it is about. Building wraps are not always used for advertising, they can obscure building sites, buildings under-going work, sometimes including a sneak preview of what will be unveiled. Some building wraps are even used while refurbishment of an older building is being undertaken, to make it a more pleasurable image for the viewer. One example of this was St. Paul’s Cathedral, London. Many tourists visit this site and while exterior refurbishment took place a print of the original building was made to wrap the building, mimicking the building so that pictures could be taken, satisfying visitors.